The 2030 Agenda includes three targets related to means of implementation, but none refer to education financing – even though lack of equitable and adequate financing was a key reason the world fell short of achieving the EFA goals in 2015. Regardless of the absence of a financing target, comprehensive and regular education financing data are a prerequisite for effective education sector planning and for monitoring the commitment of all partners to the global education agenda. Debates on education financing rarely consider how the sources of education expenditure – government spending, external assistance and household spending – combine and affect one another. Faced with a similar challenge, the health sector developed national health accounts to collect and process health expenditure data. A recent project aims to introduce a national education account (NEA) methodology in eight countries. For example, the government of Nepal spends 3.5% of GDP on education, 2.6 percentage points less than Viet Nam. But when households and other sources are taken into account, the order is reversed: Nepal allocates 1.5 percentage points more to education than Viet Nam. To build strong NEAs, information on expenditure flows from governments, aid partners and households needs to improve. The Education 2030 Framework for Action proposed two benchmarks as ‘crucial reference points’: allocate at least 4% to 6% of GDP to education, and/or allocate at least 15% to 20% of public expenditure to education. Globally, countries spend 4.7% of GDP on education and allocate 14.2% of public expenditure to education; 35 countries spend less than 4% of GDP and allocate less than 15% of public expenditure to education. Note: All values shown are medians. Analysis of the key public education financing indicators reveals an erratic supply of information. Only 60% of countries have data on total education expenditure as a percentage of GDP for any given year since 2000. To ensure that good data on education expenditure are available, good public expenditure management at the national level is vital. A review of public expenditure must extend to its equity focus and the extent to which it compensates for disadvantage in education. Comparison across countries is feasible but requires considerable effort towards introducing a process, agreeing on a framework and actually carrying out an assessment. To get countries on board, the emphasis should be on establishing a peer review mechanism through which they can learn from one another. Aid needs to increase at least sixfold to fill the US$39 billion annual financing gap, but in 2014, aid levels were 7% lower than at their peak in 2010. The gap could be filled if donors dedicated 0.7% of gross national income (GNI) to aid and allocated 10% of aid to basic and secondary education; since 2005, total aid flows have fluctuated at around 0.3% of donor countries’ national income. Poorer countries should be prioritized in aid, yet low income countries received 28% of total aid to basic education in 2014 while accounting for 43% of children who do not complete primary school. Levels of humanitarian aid need to be tracked as well. 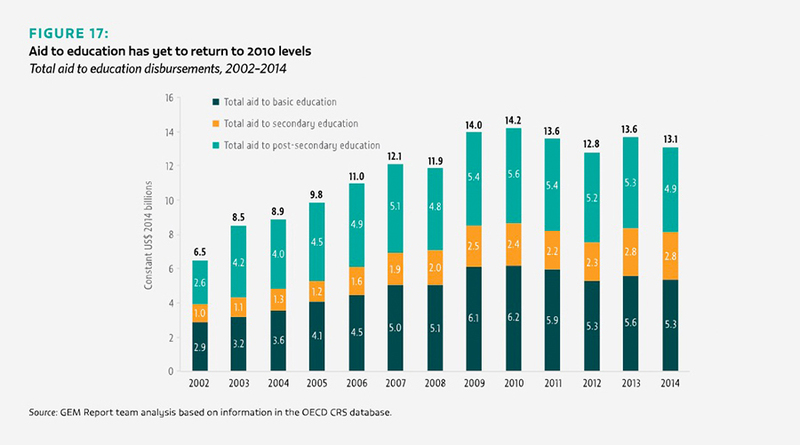 In 2015, education received US$198 million, or less than 1.9% of total humanitarian aid. The share of households in total education expenditure tends to be much higher in poorer than in richer countries. Reducing that share is key to fulfilling the new education targets’ focus on equity. Information on household expenditure is available in most countries. Analysis for the GEM Report showed that at least 99 of the low and middle income countries included relevant questions in a national expenditure survey between 2008 and 2014; 67 included questions on individual expenditure items. However, such data are rarely used. Policy-makers may be unaware of the data’s existence and importance, or their capacity to analyse them and draw relevant conclusions is limited.